Let’s say you’re a fledgling art collector. Let’s also say you’re at your first art fair. But you don’t know the first thing about art fairs or what you should do there, besides look at and appreciate all of the art on display. That’s okay. For a little art fair education, you’ve come to the right place. Of course, the best thing to do is to, well, do. Go to a fair. Walk around and get a feel for the art. But even at the most casual and unpretentious art fair, there's still standard etiquette, customs, and protocol to follow. So how do you navigate your first foray into the art fair world - especially if you find something that catches your eye? To find out, we've tapped into our industry network to help put together a primer full of useful advice and helpful etiquette on how to buy art at an art fair. The first thing you should do before you attend an art fair is to look online for the art fair’s website. This is a great way to prep before the fair, so that you know which artists and galleries you definitely don't want to miss out on. Art fairs can be overwhelming with the sheer amount of art that's on display, so highlighting a few galleries and artists beforehand can help you make the most of your time on site, and can give you some direction once you're there. Once you’ve got a few artists and galleries that you're interested in, check the schedule and get a sense of where in the fair they’ll be exhibiting their work. Most art fairs offer additional programming, aside from the gallery spaces, such as panel discussions, opening night soirees, and other related events. Plan your schedule ahead of time, so that you don't miss out on any special events, and make sure you give yourself ample time to browse through the exhibits and talk to artists and gallery owners. Some art fairs can be multi-building, multi-day affairs, so you don’t want to show up and be disappointed that you’re not where you wanted to be. What not to do: Wait until the last minute. In fact, showing up early can give you a strong advantage since art is sold on a first come first serve basis. If you wait until later in the fair to stop by, that piece that you were eyeing online may not still be available. This is an art fair, so chances are high that the actual artists will be there alongside their art. Art fairs provide a great opportunity to open a dialogue and connect directly with the artists, and this provides a lot of benefit to you as a burgeoning collector. For starters, art is largely open to interpretation, and that's one of the things that makes it so fun. But it's always interesting to find out what the artist had in mind when they created a specific piece. Not only do you want to have a deeper understanding of what the art is about, you also want to develop a history and open the door to a customer-seller relationship if you plan to purchase something. Gallery owners and dealers like it when the potential buyer is educated about a specific artist or work. But more importantly this will give you, as a collector, a more meaningful understanding and relationship to the art and artist. What not to do: Don’t be impatient, and don’t interrupt anyone already talking to the artist. An art deal might be in the making and you don’t want to get in the way of that. And never insult the art or the artist, even to yourself or a friend; you never know who’s within earshot. Always practice professionalism and decorum. Art is a hugely personal thing, and just because an artwork doesn't appeal to you doesn't mean that it's not a great piece of art and won't appeal to someone else. Once you’ve weighed your options and found something you love and can't live without, it’s time to buy some art! If you’re unsure about pricing, it’s best to just ask. At Superfine! pricing is always transparent, so you’ll never be left wondering. There are also various payment options available to a buyer. Many potential collectors assume that if they can't pay the full price of a piece of art upfront, it's out of reach, but that's not actually true. At the end of the day, an artist is there to sell their art, and many of them are willing to negotiate or help a potential collector with payment terms. If you're purchasing from a gallery, you can always ask about paying in installments. And one of our favorite ways to pay for art is a service called "Art Money" which provides interest free 10-month loans for people who want to purchase art that costs anywhere from $1,000 to $50,000. What not to do: Lowball. Yes, sometimes gallery owners expect a little negotiating. But keep in mind that art - like anything else - takes time, effort, and money to create. Art and commerce go hand in hand, and artists deserve fair pay. At Superfine!, we work hard to ensure that artists get compensated fairly for their work, and that potential collectors have access to affordable and accessible emerging art. Buying art should be fair to both parties. There are some telltale signs to look out for at an art fair—depending on the fair. One of them is a red dot placed next to an art piece, which signifies that the art has been sold. This practice has fallen out of favor in some art fairs, but we believe that being transparent about pricing and what art is available makes attending an art fair less intimidating and more accessible. Also keep an eye out for body language signs from the artist or gallery owner at an art fair booth. Loitering for too long in a booth or taking up too much of an artist or gallery owner's time when you don't plan to buy is inconsiderate. It can also block other potential collectors from seeing important pieces that they may be interested in acquiring. 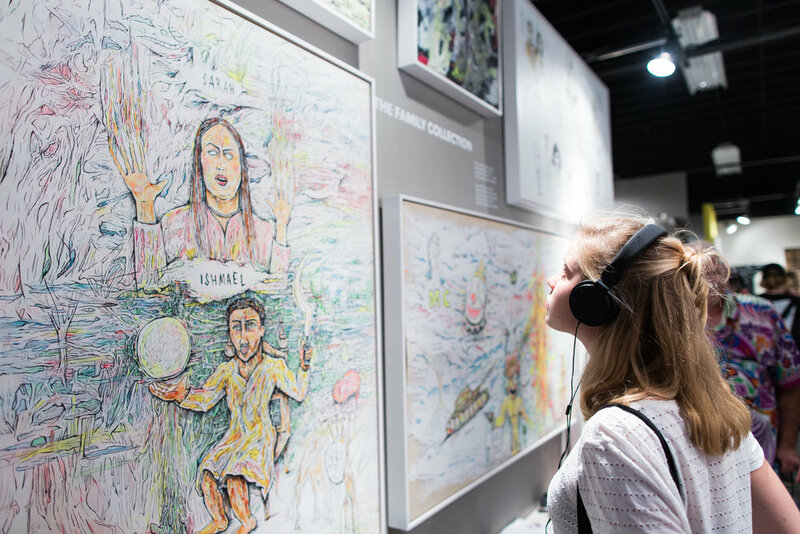 Overall, attending an art fair is a great way to begin learning about emerging contemporary art, connecting with up-and-coming artists who are pushing the boundaries of artistic styles and subject matter, and developing your own artistic tastes. So, go and go often! The more art fairs you attend, the more acquainted you'll become with the art world and the more you'll develop your own personal likes and dislikes that will help guide your own art collecting. Speaking of which; do you want to attend more art fairs and get the scoop on special discounts and art fair programming? Then take our membership survey and become part of our Collector's Society!